Creating and improving the economic potential for communities is always beneficial, but especially with the current great recession. These two areas can be addressed by looking up. As an exercise, go to a tall building in the city, look at a Google maps view of the city, rent a hot air balloon ride, or in some way look down at your city. In most cases, there will be a number of big flat roofs. These roofs are a missed opportunity for economic growth of the community. The PV solar panels would, somewhat obviously, generate electricity that the building owner can use to reduce their electric bill. In the extreme case, there will be a surplus of electricity that the building owner can sell back to the local utility company and actually make money instead of just saving money. The state of Colorado recently passed a law making it much easier for non-utility companies to resell electricity. For example, the building owner could set up electric vehicle charging stations on their property and make some income from reselling the electricity. New Jersey and California are using public-private partnerships to get solar panels installed, for example, on school rooftops. If enough rooftops install solar, and the region is getting close to exceeding current electric plant capability, these rooftop electric generators could prevent the region from having to invest in a new power plant, thus saving everyone an electric rate increase to pay for the new plant. Hopefully, this saved money will work its way back to the city and the residents. The concept can also be used for city buildings and the saved money can be used elsewhere within the city budget. Extending the heating and cooling benefits of green roofs to edible green roofs would have the additional benefit of increasing local jobs as well as local food. 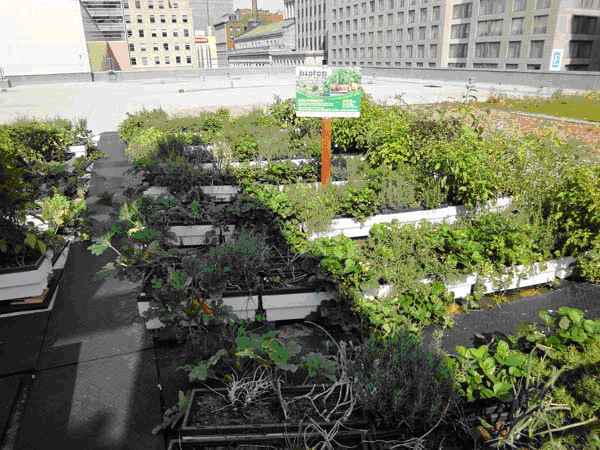 Some interesting examples of large rooftop gardens are coming from New York. A second rooftop garden example comes from Brooklyn. This one is a hydroponics greenhouse on top of a warehouse rooftop that is harvesting 365 days a year. … hydroponics allow the urban farm to produce about 10,000 heads of lettuce a week – roughly 100 tons a year. The controlled environment agriculture uses 10 times less water and 20 times less land than traditional harvesting methods. Another agricultural example comes from Denver. The Brown Palace hotel in downtown Denver has added 4 bee hives and 65,000 bees to their roof and "can produce upwards of 150 pounds of harvestable honey every summer". "Marcel Pitton, managing director of The Brown Palace, said the honey is like 'liquid gold' for the hotel. The honey is used in the restaurant kitchen and as the basis for a lavender honey soap and a local beer, made with the Wynkoop Brewing Company." The article states that the beekeeping program started "three years ago, after the city passed an ordinance in 2008 allowing hobbyists to own hives." Thus, emphasizing the importance of planners working with the city to make the conditions appropriate for roofs to become economic generators. As one example, Biotop has an edible roof integrated system for growing food. It is lightweight and can be installed on an existing roof without structural modifications. The Montreal Convention Center installed this system over the summer during the Ecocity World Summit 2011. The food grown went to local restaurants. First, make sure that the city's Comprehensive and Sustainability Plans include using the rooftops in creative ways, so as to encourage economic benefit to the building owner as well as the city and its residents. Second, create one page briefs. These would be short educational brochures to inform the building owners of the potential cost savings or income potential from different roof uses. Logistic, cost, and other "barriers to entry" should also be noted to help the building owner decide if one of the options is not appropriate for their building. Third, do some free advertising for building owners that implement a rooftop economic generator. For example, highlight the business on the city web site or in the local newspaper. Use the company as a case example highlighting what it took the company to implement the economic generator. This could be framed as this month's "Rooftop Economic Generator Winner". Over time, revisit the company and have another article, or award, highlighting the economic benefits that the company has generated from the rooftop effort. Forth, make sure that all zoning and ordinances allow these economic generators on the roof. For example, see New YorkCity’s Zone Green above. Also, for the edible rooftops, allowing food stands to be set up around the city would help the food growers to sell the produce to residents. Wheat Ridge, CO claims to have one of the most liberal food stand policies in the U.S., allowing food stands almost anywhere: "This ordinance updated the city's regulations so that community garden (under the category "urban gardens"), farmer's markets, and produce stands are now allowed in any zone district." Fifth, which is a subset of Zoning and Ordinances, is to allow green roofs to count towards open space requirements. This will give developers more ground space for development, increasing their profit. This should also increase city tax revenue (sales tax for increased business size, increased property tax from larger building/more housing units). Sixth, make it easy. For the most part, the building owner is most likely not concerned about trying to run a second business. A big box chain store will not want to change their focus. A small mom and pop business may already be stretched on available time and brain power. To overcome this, the city can do some of the leg work for the building owners. For example, consolidate all needed forms and steps into a pre-packaged form. Consider the case of an edible green roof, the city can have on hand a leasing contract that the building owner can use with the farmer that wants to lease the roof space. The building owner can then use these forms verbatim, or modify them as desired. As a case study, look at Santa Cruz. They have 7 pre-approved ADU packages that, if selected by the home owner, allows for shortening the building approval process. Seventh, create a new "unused rooftop" tax. This should only be used if all other means to encourage effective rooftop uses fails. The concept for this tax is that if a commercial building owner with a flat roof does not implement an approved economic generator use for a "sufficient" percentage of their roof, than the building owner has to pay a tax for this unused space. If the building owner does implement an approved use for enough of their roof, then there is no tax. By looking up, cities can "create" additional space to plan for the future. With some creating thinking, the unused space rooftops in the city can become an economic generator. Kohl’s, a department store chain, will have 150 solar locations by the end of this year, the company said. But it is also testing wind energy and plans to expand the number of electric vehicle charging stations at its stores.